Laura Putnam is an author and CEO of Motion Infusion, a well-being training and consulting firm that provides creative solutions in the areas of engagement, behavior change, human performance, and building healthier, happier, and more innovative organizations. 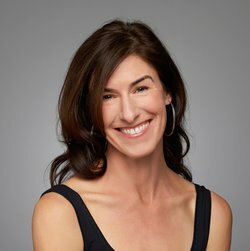 A leading authority on how organizations can promote well-being at work and inspire employees to adopt healthier behaviors, Laura is a frequent keynote speaker, provides training workshops nationally and internationally and has worked with Fortune 500 companies, government agencies, academic institutions and nonprofits. She also serves as the chair of the American Heart Association’s Greater Bay Area 2020 Task Force and is a recipient of the American Heart Association’s “2020 Impact” award. Recent appearances include MSNBC “Your Business,” NPR, Business Insider, Investor’s Business Daily, Monster.com, The Globe and Mail, and San Francisco Chronicle. Laura’s unique voice on workplace wellness and engagement is informed by her experiences as an urban public high school teacher, learning and development professional, community organizer, staffer for the U.S. Senate Subcommittee on Antitrust, nationally competitive collegiate gymnast, professional dancer and certified Pilates instructor. A graduate of Brown University School of Education and Stanford University, she lives in San Francisco with her fiancé. Her book, Workplace Wellness that Works: 10 Steps to Infuse Well-Being & Vitality into Any Organization, was published by John Wiley & Sons (June 2015). Morris: Before discussing your book, Workplace Wellness that Works, a few general questions. First, who has had the greatest influence on your personal growth? Putnam: My grandmothers. My grandmother on my dad’s side taught me about love and living life according to steadfast principles. My grandmother on my mom’s side, who incidentally married 5 times, ran for Congress, and looked like a movie star, taught me about really going for what I want in life – and doing it in style! Morris: Who and what have had the greatest impact on your professional development? Putnam: Bill Baun, wellness officer at MD Anderson Cancer Center and leading voice in the field of workplace wellness, has been a mentor, a good friend and has acted as a big brother to me. He has helped to nurture me in the field and I actually dedicated my book to him. One of my favorite students, Loran Simon, challenged me every step of the way when I was a public high school teacher. A gymnastics coach, Bobby Semes, taught me about living life with a good sense of humor, lots of joy and being in the moment. All three influenced me in my efforts to bring a playful spirit to the work that I do. I’m at my best when I’m having fun – and I sincerely believe that this is the way to effect change. Morris: Years ago, was there a turning point (if not an epiphany) that set you on the career course you continue to follow? Second, as a Pilates instructor, I found myself saying the same thing over and over again to my clients: “Great that you’re here, but it’s really important that you move the rest of the day – especially at work.” And, invariably, most responded, “I wish I could, but I really can’t at work.” This conversation compelled me to look for more effective ways to get at the source, namely the workplace. It also awakened me to the fact that the workplace is the ideal place to tackle the issue of health and well-being. Considering that the majority of adults spend the bulk of their waking hours at work, we could transform the health and well-being of our country – one workplace at a time. Each employer, I believe, has the opportunity to build an oasis of well-being to offset the effects of a larger environment that has become increasingly toxic for our health and well-being. Putnam: My undergrad and graduate alma maters, Stanford and Brown, have provided me with a network of peers that is unmatched. For example, one of my roommates is now the highest-ranking female executive at one of the largest technology companies in the world. It goes without saying that these friendships are enormously helpful, not to mention incredibly inspiring. Beyond this amazing network, my schooling shaped my capacity to maintain an autonomous mind-set. Being an entrepreneur, as well as an author, calls for the relentless pursuit of thinking differently. Morris: What do you know now about the business world that you wish you knew when you first went to work full-time? Putnam: I wish I had known how important it is to brand yourself – and that it’s never too young to start. I often feel like I’m playing a game of catch up, especially in the world of social media. Putnam: So true! The goal is to motivate people by instilling a sense of ownership. Nothing is more powerful. Putnam: Yes – and something that I have to remind myself of over and over again as an entrepreneur. Vision, while important, is only the start. The hard part is the doing part. Success happens as a result of perseverance and relentless tenacity. My favorite Edison quote (which hangs on my refrigerator door) reads: “Opportunity is missed by most people because it is dressed in overalls and looks like hard work.” Grit and putting on our figurative overalls everyday is what counts the most in the end. Putnam: Well said. I feel like one of the hallmarks of success is being able to identify early on which paths are worth pursuing, and which ones are better off left alone. I’m constantly looking for ways to streamline my efforts. Putnam: Storytelling is everything. If you want to be an influencer, you have to be a great storyteller. Workplace wellness largely boils down to influencing behaviors, and it’s the storytellers who captivate followers, rendering change on a large scale. Oprah Winfrey, for example, wields tremendous influence as a result of her ability to tell stories and connect with people. We need a lot more of this in the field of wellness – and we’ve made the mistake of lauding statistics over stories. It should be the other way around. While science is critical, health promoters need to become masters of persuasion – and the only way to do so is by becoming a phenomenal storyteller. This is why I coach others in the field to not only stay up to date on the science, but to also build their story banks. The latter is what is going to move people. Morris: Most change initiatives either fail or fall far short of original (perhaps unrealistic) expectations. More often than not, resistance is cultural in nature, the result of what author and business professor James O’Toole so aptly characterizes as “the ideology of comfort and the tyranny of custom.” How best to avoid or overcome such resistance? Putnam: Great question. Culture is incredibly powerful. In fact I would contend that we are less creatures of habit and more creatures of culture. So, increasing the likelihood that employees will engage in their well-being requires curating a culture and an environment in which the healthy choice is the easy choice and the “normal” choice. Perhaps one of the best examples is Patagonia. Shaped by the founder’s call to “Let my people go surfing,” well-being at work, which might be surfing at lunchtime or holding a meeting outdoors or giving back to the community during work time, is business as usual. Morris: Looking ahead 3-5 years, what do you think will be the greatest challenge that CEOs will face? Putnam: Reconciling the need to perform with the need to recoup. Leaders and managers are putting pressure on their teams to deliver results. But, lest we forget, teams are composed of human beings, not machines. At this point, there is a giant disconnect between the recognition of stress and burnout as a problem and the willingness (on the part of the employer) to actually do something about it. According to a recent survey conducted by Towers Watson and the National Business Group on Health, 78 percent of employers identify stress as the number one workforce risk issue, but only 15 percent of them are actually doing something about it. That needs to change! Addressing this growing issue, however, is much more than giving stress management tips, tricks and tools to employees. For many, the workplace itself is the primary source of stress. Therefore, employers need to proactively uncover and then confront deeper and broader issues such as long hours, demanding deadlines, work overload, lack of job security, along with perceptions of unfairness and lack of control. Morris: Now let’s shift our attention to your book, Workplace Wellness that Works. When and why did you decide to write it? Putnam: It all happened pretty fast. Out of the blue, an editor reached out to me, asking if I’d ever thought of writing a book. I was, of course, thrilled. We set up a time to talk, I called her, and never heard back. I thought that was the end of that! Then, a couple of years later at a party, I met an editor from the same publisher. After sharing my story, I asked if she might be willing to provide some feedback on my ideas. She agreed. We talked and in that same conversation, she encouraged me to submit a proposal. Within a few weeks, the proposal was accepted and the book writing was put on a fast track. And, I mean super sonic fast track. I was given four months to write the entire first draft – start to finish. Putnam: Yes. How murky incentives are. Prior to writing the book, I was strongly opposed to the use of rewards or penalties, in any form. Now I see how they can come in many different shapes and sizes. While some are bad, others are positive and effective. For example, I think that subsidizing healthy options in the cafeteria is a great idea. It’s a way to nudge people to make the healthier choice, without being overly coercive. But, I continue to think that rewarding people, or, God forbid, penalizing people for not taking part in, say, a biometric screening is bound to lead to a lot of resentment, causing more harm than good. Morris: To what extent does your book in final form differ [begin italics] significantly [end significantly] from what you originally envisioned? Putnam: It’s a lot longer than I had envisioned. Morris: In your opinion, what are the defining characteristics of a workplace within which well-being and vitality are most likely to thrive? Putnam: I’ve dubbed the defining characteristics of a workplace within which well-being and vitality are most likely to thrive around the 5 “F” factors. First, at a very basic level, do people have what they need to do their job? This is what I refer to as the “functioning” factor. Above this is the “feelings” factor. Do people trust the organization? Do they feel respected by their boss and coworkers, or are there a lot of people with hurt feelings? Next, do people like one another? This is what I refer to as the “friendship” factor. Then, do people have opportunities for growth? This is what I refer to as the “forward” factor. Lastly, do people feel inspired when they’re at work? This is what I call the “fulfillment” factor. When all five of these factors are in place, then well-being is much more likely to thrive. Morris: I am convinced that workplace wellness will help any organization to achieve its strategic objectives and that it will also nourish the personal growth and professional development of those in its workforce. What are your thoughts about all this? Putnam: Absolutely. But simply having a wellness program is not enough. You need to have one that is well conceived. I’ve seen many examples of “check the box” wellness programs that elicit little or no participation. Worse, I’ve seen examples of organizations that employ a “wellness or else” approach. It’s no wonder that workplace wellness has generated a lot of negative fallout. In contrast, when a workplace wellness program is done well (and when there’s a positive culture that supports it), it can be good for the employees and great for the organization. Done well, it can help individuals to thrive and at the same time, help the organization achieve strategic objectives such as increased productivity, boosted morale, reduced absenteeism, reduced risk of injury, reduced return to work time, increased retention and attraction, and ultimately increased profitability. Morris: As I indicate in my review of Workplace Wellness That Works for various Amazon websites, I think you make brilliant use of several reader-friendly devices such as the dozens of “Action Item” exercises throughout your narrative. What do you hope these exercises will achieve? Putnam: My hope is that the book will empower readers will do something different. I often begin my talks with the following advice: “What I say doesn’t matter. All that matters is what you actually do as a result of this talk.” I tried to bring the same spirit to this book, and was very intentional about providing hands-on tools so that readers would feel like they could actually do something different or new as a result of reading the book. Morris: Since the book was published, what feedback has surprised you? Putnam: It’s been surprising, but very gratifying, to hear from a number of people that the book is serving as a “bible” for them in their efforts to promote health and well-being in their organizations. Putnam: Emotions drive behaviors, not logic. As a field, we’ve emphasized statistics over stories and being the expert over being an agent of change. Then, we scratch our heads wondering why employees aren’t more engaged. It’s a no brainer. We have to move away from such a head-based, medical model to one that brings a lot more passion and emotional intelligence to the field. Putnam: Wellness – done well – is less about health and more about becoming our best selves. The truth is that for most of us, better health and disease prevention are not motivating. However, becoming our best self is. This kind of discussion begins with empowering people to imagine what’s possible, not just “get healthier.” We need to move beyond the standard fare of wellness — nutrition, fitness and smoking cessation — and take a more holistic approach, addressing multiple dimensions like emotional, social, community, career and financial well-being. Putnam: If employers really want to make a difference in the health and well-being of their employees, they would be wise to focus on addressing the culture first, as opposed to focusing on the individual. I can’t tell you the number of times I’ve seen a wellness program undermined by a negative culture. If the culture is negative, it is unlikely that employees will ever engage with any wellness efforts in a meaningful way. A positive culture, on the other hand, creates the conditions in which people are more likely to motivate themselves and authentically engage with wellness offerings. Putnam: Wellness has adopted a “start with what’s wrong” approach. With terms like “disease management” and “health risk assessments,” we have done a fine job of scaring people away from wellness! It’s no wonder that over 80 percent of eligible employees are opting out of wellness. We need to turn this around, initiating our efforts with a “start with what’s right” approach. We need to encourage people to identify their well-being strengths first and then build on these to address their challenges. Putnam: Keep in mind that the goal is to create a new way of doing business in which well-being is infused into the fabric of the organization. To accomplish this objective, we need to break down silos, coordinating with every department in the organization, to create a multidisciplinary team. This “da Vinci” team is what will give your wellness movement staying power! Putnam: Go where the resources are. Identify what’s most important to your organization and then find ways to “sneak” wellness into both top-ranked initiatives as well as daily, business-as-usual events. Instead of stand-alone wellness programs, incorporate well-being into every staff or team meeting, leadership development programs, management training programs, safety training, and new hire programs. Putnam: Rather than check-the-box programs that depend on coercive sticks and carrots over quality to drive participation, effective wellness programs are much broader based. A well-designed wellness initiative encourages social connections, provides opportunities for recognition, and most importantly, respects employees’ need for autonomy and personal choice. These are the kinds of qualities that create meaning. Putnam: Circumvent the motivation issue altogether by simply making the healthy choice the easy choice and the “normal” choice. I like to call this “nudges and cues.” Nudges are environmental prompts, such as healthy food options in the break room, accessible stairs or nearby walking paths that make health at work easier. Cues, on the other hand, are cultural prompts that effectively give permission to employees to engage in well-being at work. Every manager can cue their team members into well-being with rituals such as regular check-ins at the beginning of staff meetings or mini-stretch times. Putnam: Don’t be afraid to experiment to see what works, what needs to be tweaked, and what should be ditched altogether. Pilots are a great way to generate an iterative approach. Putnam: We can share best practices and lessons learned across organizations and across borders. This kind of shared learning, I believe, is what’s needed to truly launch a movement of well-being around the world. Together, we can build a healthier, happier world – and this can happen one workplace at a time. I hope your readers will take a look for themselves and join the movement for better workplaces and a healthier, more fulfilling society. Laura cordially invites you to check out the resources at her website.